or the 2019 Printable Planner Bundle at Etsy for $8.99 now! Created with a minimalist design in mind, each page gives you plenty of space for yearly, monthly, and project planning, or even doodle it if you wish, but the main focus of this planner is on weekly planning. Each weekly planner page is created with three sections: the Appointments section to help you track appointments, events, or deadlines that have a time frame; the Habit Tracker to track specifics task or habits you want to do daily for the week; and the Weekly Projects & Goals section for writing down the weekly project tasks, goals, and to-do list for things you need to do that week but which has no specific time or day when it needs to get it done. 12 Monthly Calendar pages and 12 Monthly Projects and Goals pages. 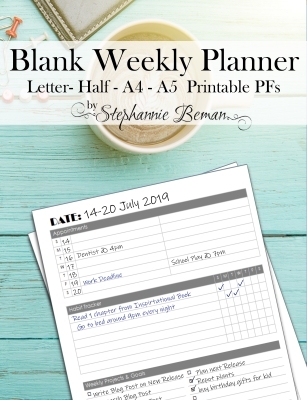 53 Weekly Planner pages with a section for appointments, a weekly tracker to keep track of those pesky tasks that you need to make sure you have done daily, and a to-do list for weekly projects and goals. 4 pages to list “Things I Need To Do This Year” and “My Projects To Do Next Year”. 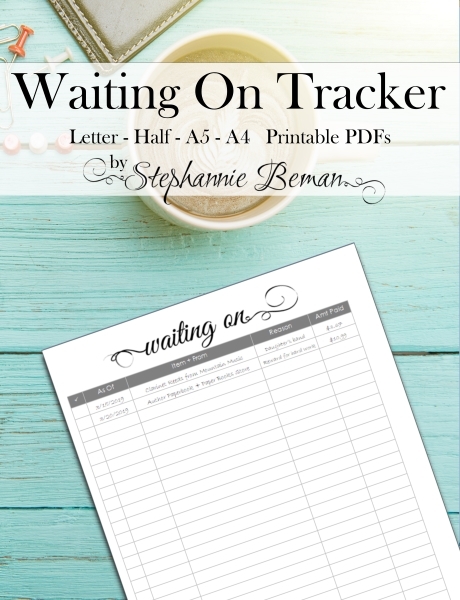 7 Waiting On pages to track of the purchases or submissions you are waiting on. 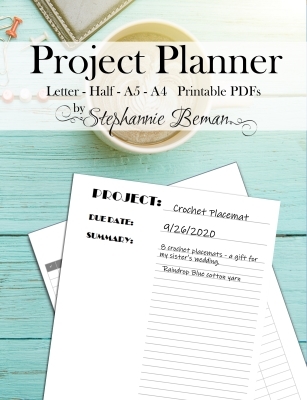 30 Project Planner pages for brainstorming and planning your projects you maybe working on at any given moment. 30 Notes & Ideas pages is lined paper for brainstorming and writing down reminders about ideas you might have. 30 Mind Mapping & Sketches pages is a blank paper for sketching pictures or brainstorming ideas. “It’s a great tool. I’ve been using these planners for three years now, and it’s helped me stay organized. I’ve also enjoyed the fact that I can track down my progress, so on days where I feel like I haven’t done much, I can look over the planner and see how much I’ve accomplished over the year. It keeps me motivated. “I still have the ones I used for the past couple of years. It’s nice to go over them from time to time and see what I’ve done. After a while, I’ve noticed how I can best pace out my projects because I can see where the project started and where it ended. It helps me plan out future projects since I have a better idea of my natural work schedule. …is a weekly planner page gives you plenty of space to plan your week, or even doodle on if you wish.